After indulging in a drip-drip teasing marketing campaign for this product, Razer has finally launched the Razer Turret for Xbox One. 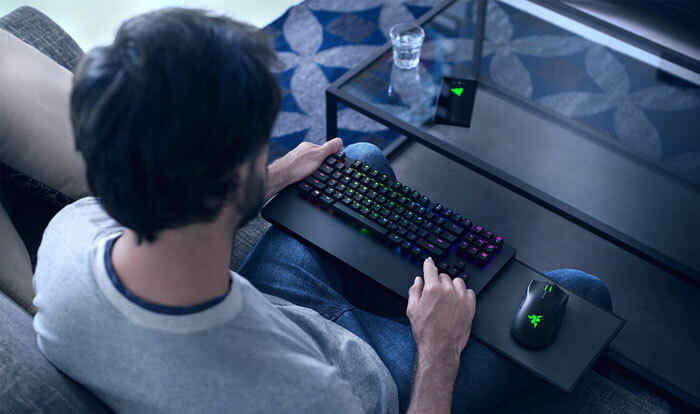 It not only looks like it was inspired by the 2016 Razer Turret for sofa-friendly PC gaming, it shares the 'Turret' name. Furthermore, the full product description and images confirm that the mousing platform extends and retracts from the right. "We're extremely proud to team up with Microsoft to bring you this exclusive collaboration," says Razer Co-Founder and CEO Min-Liang Tan. "With the Razer Turret for Xbox One, it is now possible to bring the full experience of a keyboard and mouse, with lighting and game integration to Xbox One." The new keyboard features Razer mechanical switches with a lifespan of up to 80 million keystrokes. One of the keys is a dedicated Xbox key for pulling up the console dashboard. RGB-LED backlighting comes with support for Xbox Dynamic Lighting and Razer Chroma. Already gaming support has been added to games such as X-Morph-Defense, Vermintide 2 and others. The lighting will integrate with Philips Hue too. As a wireless keyboard the Razer Turret for Xbox One utilises a 2.4 GHz wireless connection via dongle. The single dongle accepts input/tracing info from both the Turret and included mouse. Battery life is said to be approx 43 hours per charge with lighting effects off, or 11 hours per charge with default lighting on. Razer has bundled a 7-button mouse that is modelled after the popular right handed Razer Mamba Wireless gaming mouse and features a high-performance 5G advanced optical sensor and Razer Mechanical Mouse Switches for good feel and durability. Battery life for the wireless mouse is 50 / 30 hours with LED lighting off/on. As mentioned in the intro, the mousing surface extends and retracts form the right of the keyboard chassis. 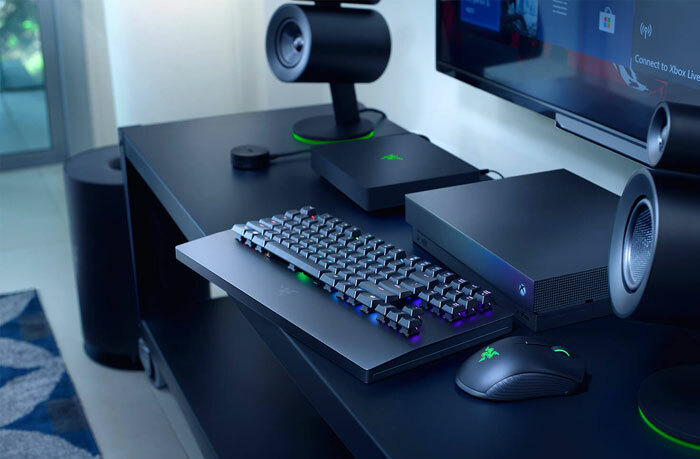 If you think the Razer Turret for Xbox One would be good for your living room PC shenanigans then you might be happy to hear that Razer confirms it is "fully compatible with PC (Windows 10)", so you can use the same setup for PC and console, if you wish. 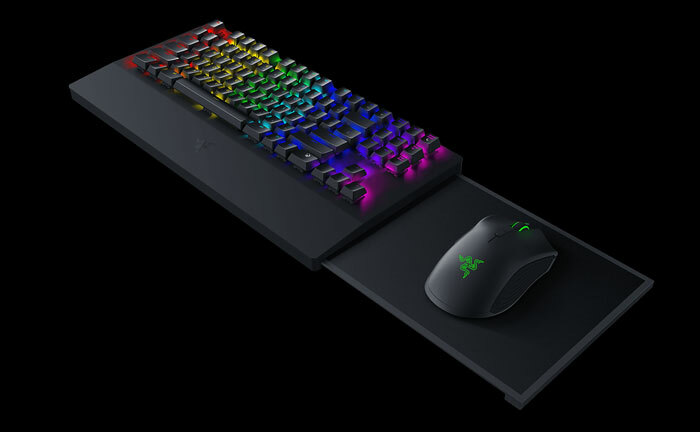 Pricing is sometimes a thorny topic with Razer gear and I predict this will be no different – at $250 this gaming keyboard/mouse combo costs significantly more than the Xbox One S console. Availability is scheduled for Q1 2019, and Razer says that if you pre-order you will get an Xbox gift card worth $25. The Microsoft store page suggests you will have to wait until "on or about March 31" for product availability. Too expensive for console use, I know some of us pay more than this just for a keyboard for the PC, but as mentioned in the article this costs more than an actual console, it is a different market and should be priced accordingly. Perhaps they will be bringing out a lower end version after they see where the sales of this goes, and it might still be tempting for the 4k One X user who wants to splash out. However, Razer can do one in general after their GPU mining software debacle, I won't be buying their stuff ever after that! Does this means you can't use regular keyboard and mouse with Xbox? id say so, but this one can connect wirelessly rather than usb. Wow. You can get an Xbox One S for less than $250. Razer Tourette, the product that makes you swear in frustration a lot!